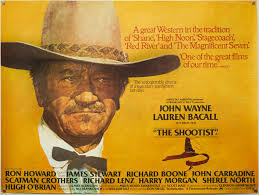 The Shootist is hard to watch, especially because there’s such an overlap between the real and unreal world of the movies. The Duke was very sick, a dying actor playing a dying man. I can’t watch it either. I’ll ask Garry about Charles G. Martin. Maybe he knows something. If anyone knows, then Garry is the one. The last shootout was an act of suicide. Then, why did JB Books fight back? Garry says Charles Martin, along with John Mitchum (Robert’s brother) played bartenders in a lot of movies, Martin in a bunch of Ford’s movies. He doesn’t know much about him, but he was a small part player in westerns, usually as a bartender. My take on why Books fights back is he wanted to take out some bad guys when he went down. He was dying and he wanted company on the road. But you could interpret it in other ways, too, though I can’t think of any at the moment. Tell Garry thanks. There must have been a bunch of uncredited stuff in his career. Garry didn’t know his name, but he remembered the face. Good post, nice research. I wondered if this was the only film in which he was called John, but of course it wasn’t. The Undefeated, Chisum, Sons of Katie Elder, The Horse Soldiers, Sands of Iwo Jima, Fighting Kentuckian and a whole load more from his very early days. Not sure about J D Cahill though? I will have to do a post about the best John Wayne character name. Ethan Edwards is at the top of my list. can’t argue with that but Cole Thornton and Chance Buckman must get nominations! I forgot about Chance Buckman. J.T. Chance is a good one, too. Just had a lazy afternoon watching a couple of Jimmy Stewart films on TV (Flight of the Phoenix & Bend of the River). I got to thinking about the top three film actor voices. It has to be completely subjective of course and based on genre, mine is the western, so I suggest John Wayne, Jimmy Stewart and Gregory Peck. Lee Marvin just outside the to three. What about you? I think John Wayne, Jimmy Stewart and Randolph Scott. Of course, there are character actors like Slim Pickens, Chill Wills and Walter Brennan. I enjoyed this movie. I did not watch many John Wayne films when I was younger. But, over the last couple of years, I watch whenever I can. I usually can catch them on Saturdays on AMC. I don’t think there’s been any that I haven’t liked. I think this one and The Cowboys were the only ones that he died in. I didn’t see it coming in The Cowboys. But in The Shootist, it was kind of reminding me of Clint Eastwood in Gran Torino. I saw a stat once about how many movies John Wayne died in. There weren’t many. Who shot Liberty Valence ? Yes, he did. The Man Who Shot Liberty Valance also started with his funeral.